The new Heckler & Koch .45 is a combat pistol designed to work in a wide range of environments. Designed for military use, it uses a blend of proven design features. Walking the aisles of the 2007 SHOT Show, I could not help but notice the not-so-small number of companies manufacturing 1911 pistols. While some models are better than others (mostly due to the quality of manufacturing and components used), one wonders how big--really--is the demand for the century-old design. As much as I like the 1911, I also realize that it is not for everyone and that variety is needed. This is why I was a bit relieved when I was told that Heckler & Koch's new .45-caliber pistol would not be a 1911 clone. With an obvious kindredship to the company's successful Universal Self-Loading Pistol, what has been simply named the HK .45 is a marriage of the USP and the more streamlined P2000 pistol. In a nutshell, the HK .45 is a polymer-framed semiauto pistol that operates from the proven Browning link-less recoil system in which the slide locks on the barrel hood. As the recoil spring compresses, the barrel is cammed down, permitting the slide to cycle to the rear. Simple and effective--just the way a pistol designed for fighting should be. Let's be honest: More than a few guns carried for defensive purposes are not as well maintained as they should be. With a design like the 1911, this "oversight" could be problematic, but the fact remains that no one should be hurt or killed because they failed to perform proper maintenance. While some may bristle at this statement, the reality is that many people serving in the military or law enforcement are not weapon enthusiasts. This does not make them poor soldiers or cops; they are just people who have other interests. In the case of law enforcement, some of the most productive street cops I ever met could not have cared less about guns. It's no secret that the U.S. military had been looking for a .45 to replace at least some of its 9mms. While this program has apparently been shelved for the time being, a number of companies developed guns that they intended to submit for this selection process. HK was one of them. While the HK .45 is not the exact gun that HK intended to submit, much of that gun's design has been incorporated into this new model. The HK .45 was developed with the input of Special Forces veteran and custom pistolsmith Larry Vickers and well-known weaponcraft instructor and IPSC/IDPA founding member Ken Hackathorn. Both men are skilled shooters and instructors with a huge amount of knowledge regarding what should be incorporated into a fighting pistol. Both are strong proponents of the 1911, so the final configuration of this gun is noteworthy. As previously stated, the HK .45 operates from the Browning link-less, but the rest of the gun is totally 21st century. The nicely rounded slide has both forward and rear cocking serrations and is snugly mated to a polymer frame that has a totally different grip than does the USP. This grip is quite trim considering that it holds a double-stack 10-round magazine. It is nicely rounded with no corners or sharp edges and has slight finger grooves in the frontstrap. Pebble-grain stippling is molded all around to offer a solid hold on the gun under a wide range of environments and conditions. I do not like finger grooves on handguns, as I want to put my fingers where they want to go and not have placement pre-set by the grip. This being said, I really did not notice the grooves on the HK .45 as they are quite shallow. If they bother you, there is enough polymer material on the frontstrap that a skilled gunsmith can remove the finger grooves. To further enhance the grip, interchangeable backstraps are included to make the grip as large or small as is required by the end-user. I have very small hands, so I was happy to see this feature. It is my opinion that this will quickly become a requirement on any handgun that is intended for military or police service and is purchased through competitive bid. Companies that do not offer interchangeable backstraps on at least a few of their pistol models will find themselves behind the curve when bids go out for new service handguns. A 1913 rail is molded into the dustcover for the mounting of white lights and laser sights. While the utility of laser sights is still debated by many, few ignore the advantages that a weapon-mounted light offers. We all know that shooting a handgun is much easier and more accurate with two hands, so the ability to keep both hands on the gun while engaging an attacker in an inconsistent light environment should not be underrated. This does not mean that the handheld white light is obsolete--far from it. The gun (and light) should never be pointed at something that is not a potential threat, so having a handheld light is essential. In addition, two lights will always be better than one. It is wise to have a contingency for everything you can, whether it is a spare tire or a white light. A rubber O-ring has been added to the 4 1/2-inch polygonal barrel to enhance accuracy. If you disassemble the pistol down to the slide and barrel, you can actually feel this O-ring grab the slide as you slowly move the barrel back and forth, making me believe that a tighter barrel-to-slide fit would be hard to achieve. The O-ring will wear out with time and rounds downrange, but I am guessing that it will take many thousands of rounds. In an effort to reduce felt recoil and lengthen service life, a polymer buffer has been added to the recoil guide rod and spring. This buffer rides along the length of the spring and keeps the slide from beating the frame as it cycles back and forth. Along the way, this feature also helps reduce felt-recoil forces by as much as 30 percent according to HK. My test gun came with a safety decock lever that was mounted on the left side of the frame above the grip tang, similar to the 1911. This flat-faced lever--which is a big improvement over that found on the USP--has serrations to offer solid contact by the thumb and when pushed up, locks the trigger action. When pushed all the way down it will safely decock the pistol, placing the hammer at rest. This system permits the gun to be carried either cocked and locked for a short, consistent trigger action or hammer down for a first double-action trigger stroke. While I can work with either action, it has been my experience that a system with both functions is not optimum. During the five years I was assigned to narcotics I carried the USP Compact with this safety decock system. I found that my shooting-hand thumb would either put the gun on safe or decock it at inopportune times. I was very grateful for the creation of the Law Enforcement Mode trigger, which offered a smooth and reasonably short first trigger followed by a short-reset, hammer-cocked trigger action. It is my feeling that the safety decock lever was made obsolete by the LEM. If I were to carry the HK .45, I would install an LEM trigger module that would make a simple gun even easier to use. Another thing that I did not like about my issued USP Compact was the dual push-down magazine-release lever. The version that was (and still is) standard on the compact was reduced in size from that found on the original full-size USP. While this did make it more difficult to release inadvertently, it also made it more difficult to push deliberately. Being a person with small hands, I could not release the magazine with either my thumb or index finger without shifting the pistol in my hand, which is not a good thing to do in a fight as digital dexterity will be diminished. I was able to make the Compact more user-friendly by adding the larger magazine-release button from the full-size USP, but I was never able to solve the problem. This ambidextrous push-down lever has been carried over to the new HK .45, but HK has greatly improved on its execution. The new lever is longer, flatter and nicely curved, following the contours of the grip and triggerguard. While I still cannot use my thumb, I can use my trigger finger, which engages the pocket created by this curvature. Instead of having to push straight down, I can now push back, which will still release the magazine. This is something that cannot be fully described in print; you just need to try it for yourself. What I did discover, however, was that when my trigger finger traveled back to engage the magazine-release lever, my thumb reflexively moved up, engaging the safety lever and creating a dead gun. This could be a real problem--all the more reason why it would be better for me to have an LEM trigger system. The sights on my test gun were the new generation of Super-Luminova night sights. These sights are not loaded with tritium but with a material that will trap light from any light source. This is not the glow paint that can be purchased at local gun shows but a substance that will hold light anywhere from 30 minutes to eight hours, depending on its mixture. It doesn't take long to charge the sights--just a few seconds--and they are an excellent alternative for those countries where tritium sights are banned, even for law enforcement and the military. Something I like about Super-Luminova sights is the ability to charge just the front sight, which certainly makes it easier to find it quickly, as Super-Luminova will glow four to five times as bright as tritium for a short time. You do have to keep them charged, which is easily done with a flashlight of any brightness even when it is in the holster. These sights have advantages and limitations, as with anything else. Don't view these like one moron I encountered who said, "I guess if I need my gun in a fight, I have to draw it and then flash my light on it before I can shoot." A true professional will understand both the advantages and disadvantages of any tool. The problem with living in the Midwest is that it sometimes gets really cold in the winter. Such was the case on the day I had set aside to test the HK .45. It had snowed eight inches, with two inches of sleet the day before. The high temperature on the day of the test was seven degrees. I headed to my gun club anyway and began my test by shooting five-round groups at six- inch Birchwood Casey Shoot-N-C targets at 25 yards. What does such a test have to do with a fighting handgun? I don't know, but many readers seem to want to know, so I performed the test. I used a Hornady Delta rest to bench the gun due to the extreme cold, as it was simple, quick and easy to do. The Delta rest is a triangular rest that can offer a number of elevations based on the surface you are shooting from. While it does not take all of the human error out of shooting groups, it does help give a good indication of just how accurate the gun is. The results are shown in the accompanying chart. The group fired by the Federal EFMJ deserves a bit of explanation. When I shoot these groups, I make it a point to never look at the target but to stay fixed on the front sight and return the gun to the same point of aim on the target. After I fired my first four rounds, my shooting partner, Jack Yahle, yelled out, "Man, you've shot one jagged hole!" Of course I lifted my head and looked. As soon as I did it I thought "Stupid!" and when I attempted to return to the same point of aim/point of impact, I fired the shot low at six o'clock. This just goes to show the importance of consistency when trying to shoot accurately. Regardless, the HK .45 proved to have excellent distance accuracy, but again, this is not the point of a fighting pistol. What is needed is a gun that can be held inside, say, an eight-inch circle while shooting quickly inside room-size distances. After all, what will stop a determined adversary is fast, accurate, multiple shots delivered to the high chest region of the torso. To see how fast and accurate I could shoot the HK .45, I moved to my club's indoor range, as it got too cold to stay outside any longer. After moving indoors, I set up a number of three-inch Shoot-N-C target dots and shot them at 50 feet as fast as I could work the trigger and get the front sight back on target. I feel that this is as good a way as any to test the gun's combat accuracy, sight visibility, trigger smoothness and general handling qualities. Since there is no way to recreate combat stress for a gun test, fast follow-up shots seem to be a reasonable compromise. I used the same loads as I did for the 25-yard test and noted that I was grouping a bit to the right. At first I thought that this was due to my lack of trigger control, but after it continued through several loads, I decided to drift the rear sight a bit. This resulted in a number of nice rounded groups in the center of the Shoot-N-C dot. From there on, keeping reasonable rapid-fire groups proved to be no problem. The gun also proved to be quite reliable with no malfunctions whatsoever after several hundred rounds. In an attempt to get the gun to jam, Jack and I returned to the great outdoors and threw the HK into a snow pile. After pulling it out, we continued to fire it without malfunction, though it did throw snow all over our faces. I'm not going to kid the readers: The double-action trigger was not the best I have ever felt. While certainly manageable, it was a heavy 10 1/2 pounds. The single action was a reasonable 51/2 pounds with a bit of overtravel once the hammer fell. If I were to carry this gun with this trigger system, it would be in the cocked-and-locked mode, but again, the LEM trigger is the way to go. An overtravel stop, such as that found on the HK Expert model, would help here. Make sure that the overtravel screw is locked in place so that it cannot back out if you decide to go this route. Some will say that such a modification has no place on a combat gun, but it has been my experience that anything that can be done to improve trigger action is worth exploring provided it does not affect reliability. 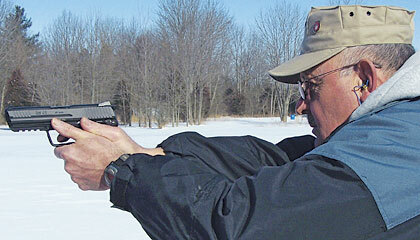 The late Jeff Cooper had it right: A fighting pistol needs a good trigger, good sights and complete reliability. Does the HK .45 measure up to Col. Cooper's highly regarded standard? I would say so, though I don't think he would have approved of the trigger action. But as I said before, the 1911 and single-action trigger system are not for everyone, and for those who want something different, the Heckler & Koch .45 will likely fill the bill.